Mayiga (C) briefs the media during a tour of the facility today. Ronald Kabuye. BUGANDA. Buganda Kingdom still requires Shs2 billion to complete reconstruction of Kasubi Tombs. The kingdom premier Owekitibwe Charles Peter Mayiga who was briefing journalists during the media tour on the progress of the reconstruction of the facility said the major works remaining are on the main house commonly known as ‘Muzira Muzampanga’ — where four former kings of Buganda Kingdom are interred. 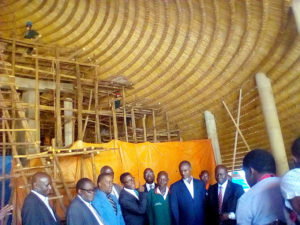 The Muzira Muzampanga is at the stage of weaving the reeds that make up the sealing, officials said. Kasumbi Tombs was razed by a mysterious fire on March 17, 2010. Investigations into the cause of the fire appear to have been abandoned altogether as the kingdom focused efforts on reconstruction of the burial grounds for its royals. Kasubi Tombs is a world heritage site recognised by Unesco. The media tour followed public criticism over delays on completion of the reconstruction of the tombs, with many claiming that the works have been halted. Mayiga estimates that works at Kasubi Tombs will be completed in 2018. The Katikkiro attributed the slow progress of the works to the strict cultural norms that are performed by the hard-to-find persons in the various clans and the hard-to-get construction requirements, especially vegetal materials like reeds, grass, among others. Journalists and other officials access the main building at Kasubi Tombs during the tour. Ronald Kabuye. The Katikkiro said about Shs4 billion have so far been incurred on the reconstruction works. The Government and the kingdom have shared the cost incurred thus far, the premier added. “We estimate that Shs2 billion will be sufficient to finalise and give a good and descent look to the palace,” Mayiga said. However, the Katikkiro finds himself hamstrung in efforts to speed up the process of the touristic site’s reconstruction. Kabala Ronald Mutebi last year directed that monthly public tour of the reconstruction works cease immediately. The king did not go into details for the directive. The Kabaka also suspended his Katikkiro’s public fundraising project, popularly known as ‘Ettofali.’ This means Mayiga can only rely on funds generated from the kingdom’s activities and businesses, as well as contributions from development partners. The kingdom is waiting on the pledge of $500,000 grant by the Japanese government toward purchasing of fire fighting and protection equipment for the tombs. Mayiga said the money was channelled through Unesco. However, he added that Unesco would release the funds once it received bills of quantities from the building committee headed by Kaddu Kiberu.